I hope you're enjoying the series this year. When I started planning for this year I knew I wanted to have more guests and bring in more inspiring tags. This response to my outreach has been phenomenal! I am feeling so inspired by my guests in terms of new tag ideas and translating these tags into Christmas cards! When creating my card for today I fell irrevocably in love with Golden Glitz Delicata ink! I have had other gold inks before but they are not even close to the incredible coverage and finish of this ink! I have heard all the buzz about it but until I cracked open the case and tested it out I was not a believer! The picture is not bad, but it is even more gorgeous in person! 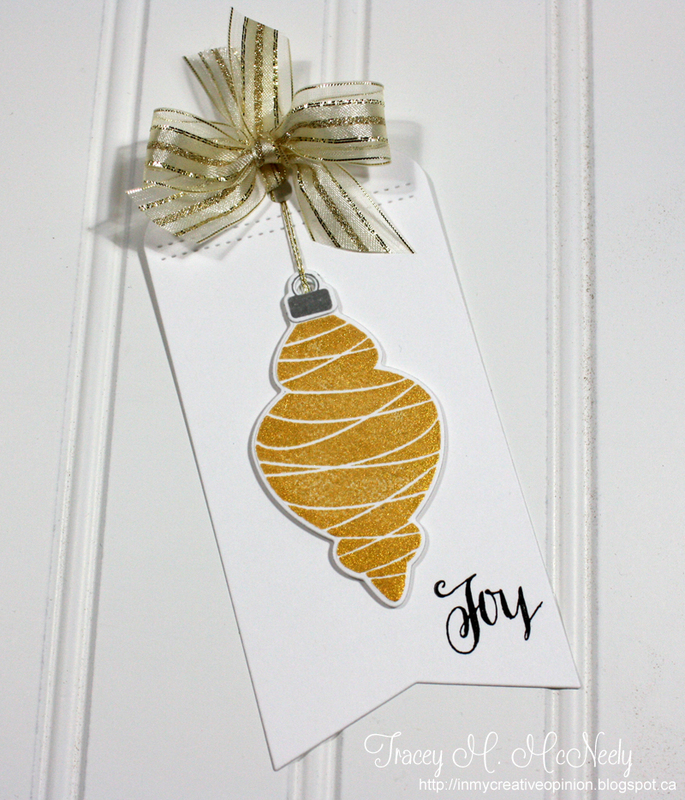 I stamped the ornament in gold Delicata ink, the ornament topper in grey, gold thread for the hanger and gold ribbon to finish it off. 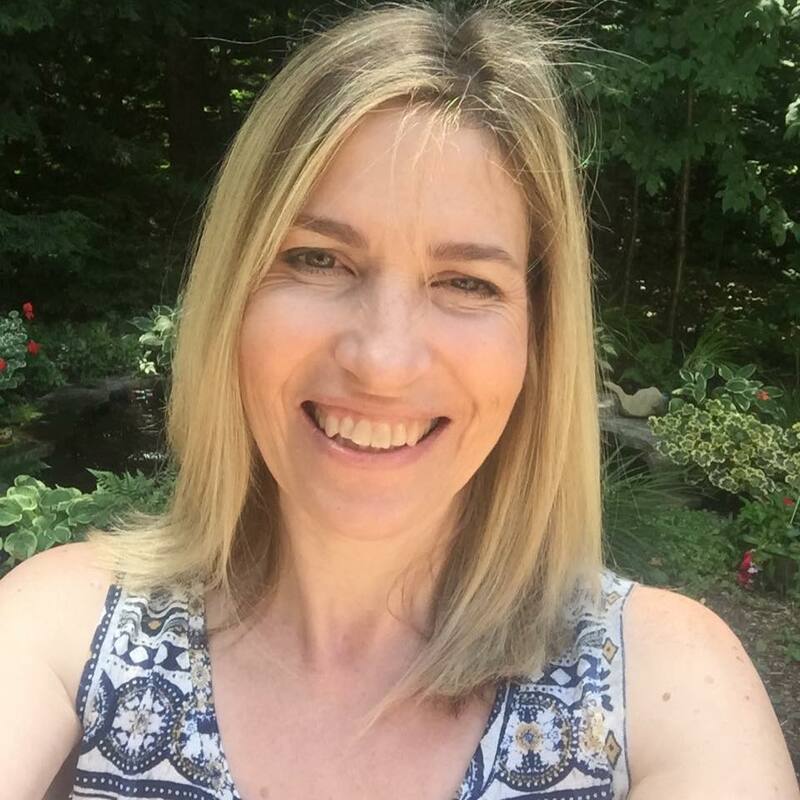 For a chance to win today leave a comment below telling me if you have ever tried gold ink and what your experiences have been..
Don't forget to visit Cristina's blog as well for another chance to win. Thank you so much Cristina for sharing with us today! Must check out that ink. I t look fabulous on your tag! And Cristina's die cut house tag is awesome! Oh I love Cristina and your elegant ornament is amazing Tracey. Sorry to hear you've been missing ALL THE FUN of Delicata. (tee hee hee) Such an elegant tag today, Tracey. And way to go getting Ms. CAS on board. both of you did a great job. I love gold so your card is awesome for me and the die cut, clever clean--quintessential Cristina! I use Delicata gold ink and it is fantastic! I have never tried a gold ink- have silver - will have to find this and check it out. Your ornament is just gorgeous. LOVE your ELEGANT tag with the golden ornament & LUSCIOUS bow - WOW!!! I haven't tried gold ink yet but it sure looks pretty. I love your gold ornament...heard many good things about this ink. I have a pretty pathetic one right now so I tend to emboss in gold instead. This tag is so awesome! I love the house as the O! I have never tried gold ink. I look forward to reading others experiences with it. So beautiful Tracey! I have Gold Brilliance Ink. I'll have to get Delicata and compare. LOVE Cristina's tag and your tag, Tracey! AND LOVE me some Delicata gold ink! It is so hard to capture the shine and sparkle and gorgeousness of it but you did a great job! Awesome! Two beautiful tags! LOVE the gold on your tag and NEED to try the Delicata ink to see what all of the buzz is about! These are beautiful! I tried many gold inks until I found Delicata, I won't be trying anymore because it is the best! Both tags are so different, yet both are stunning! ...so sorry, forgot to answer your question. I have used gold ink but never had good luck with it... I usually just use Ranger Fine Gold embossing powder instead - which is amazing, I think. Stunning pair of tags today! I love that house in place of the "O", so so sweet and that gorgeous gold ornament, wow! I have the Gold Brilliance ink and it works for me. I will try the Delicata once this is gone. Love your pretty tag...and Cristina's tag too! Tracey, this tag is a joy!! I didn't know you could get gold ink and I thought this was embossed. It looks fabulous, I bet we can't get that here!! Your tag is lovely! I think I have a 20 year old colorbox gold ink pad somewhere! Obviously not used much. I just use gold EP. I'm usually more of a silver person but the delicata might make me a convert! I love the negative house used here! Another wonderful batch of tags! I have gold ink, gold embossing powder, gold everything and I don't use any of it as much as I should! Love Cristina's CAS tag and I love the Golden Glitz Ink, it is such a rich and elegant color. And I like that it dries fairly quickly. Any other gold ink I've tried smudges too easy and doesn't dry completely. I need to buy the silver Delicata next. I have had a hankering to get out the delicata! That's for the inspiration! Your guest's tag is lovely! Great design! Yours is gorgeous too - love the ribbon! My experience with gold ink has not been good so I usually end up heat-embossing in gold instead. Your Golden Glitz Delicata looks fabulous! I'm your newest follower! Very pretty ornament card. I have some gold ink but I usually clear emboss over it. I have stamped with gold ink and I've used the embossing powder. the gold ink didn't leave a very strong impression when I used it. It's not something I use a lot. Love the house die cut. Clever idea. oh my so totally awesome and GORGEOUS..
Love the Clean & Simple look of your tag. Delicata is one of my faves, too. Your tag is amazing Tracey! I LOVE that gorgeous bow! Christina's tag is lovely too. I love the little cut out house! Cristina's tag is so totally CAS-alicious! But I have to say your tag is gorgeous! I have heard about that brand of gold ink being really good. Think I need to get some myself. None of the ones I've tried have worked all that well. :-). Thanks for enabling me! LOL. Pretty tag! I love the look of that gold Delicata ink! I do love gold and have used gold inks. To get a really pretty gold effect I have mostly used gold embossing powder though as the inks I have tried didn't have that great of a look on their own. The home tag is so clever and the ornament is elegant and CAS bliss! I have used Delicata Gold and love it...now I want to try the silver version! So elegant and very pretty! 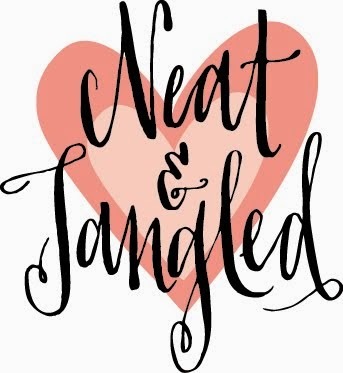 And, love all the fab tags...so fun! You've sold me on that gold ink. Just today I was wishing for gold but not wanting to get all my embossing stuff out. I've thought about the delicate ink many times, and now I'm ready to take the plunge. Love both yours and Cristina's tags today! Tracey, your tag is beautiful! That gold is amazing! Cristina's tag is warm and cozy...love it! Those are so sweet, Love the dies! very asesome, I am getting so much inspiration from this daily hop!! Cristina's tags are darling and your golden ornament knocks my socks off!!! The tags are lovely. I have tried some gold pigment inks. Oh.... this just ROCKS, Tracey! I love the take and your clever use of gold Delicata Ink! Wow...that ribbon is absolutely perfect! 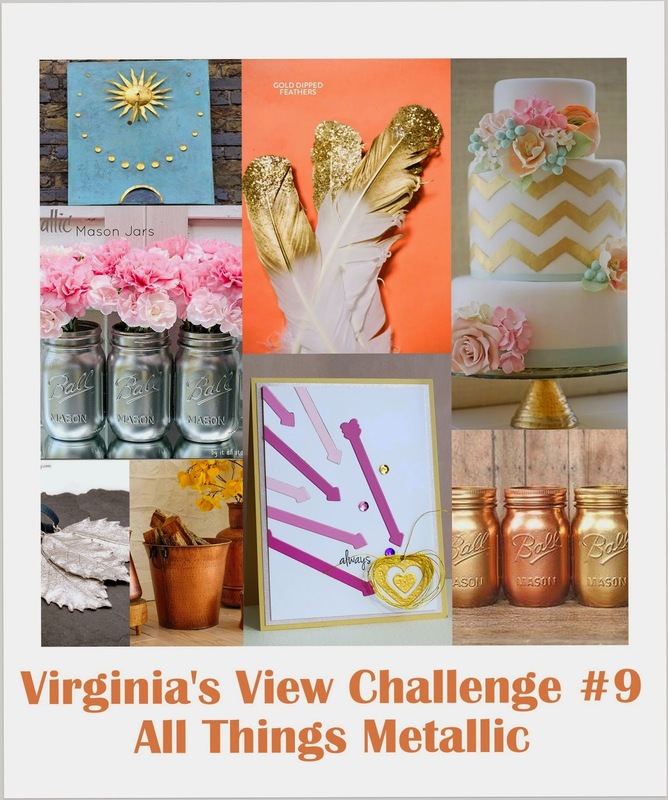 Thanks so much for playing Virginia’s View “All About Metallic” Challenge! And congrats again on the Simon Says Stamp Spotted feature! Yay! Two more fantastic tags! Tomorrow is my day in the craft room to use all the inspiration you've provided to make some tags of my own, can't wait! Thanks for sharing your GORGEOUS tag. I absolutely LOVE that ink, too! (And they make silver too!!) 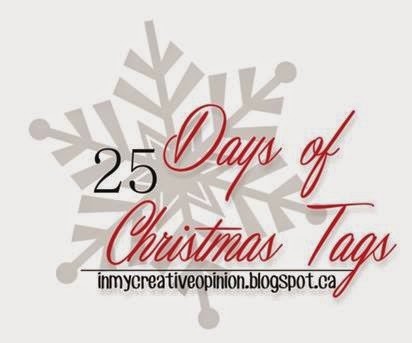 Your golden ornament tag is so elegant :) Cristina's tag is adorable!! Love the little house as a "letter"! I've tried gold ink pad and I love the shimmer but it didn't stamp as well as my other inks. It was the one by Brilliance...I still love it though! Have never used gold ink. Your home tag is fantastic! Beautiful tags! I've had mixed results using gold ink, so I'll have to try Delicata. Oh, I love both of these! Love Cristina and her work! (books included) So happy to see her as a guest today! Like you, Tracey, I wasn't 'sure' about the Delicata, but after buying a pad a couple months back, there's no turning back! It's gorgeous, as you've discovered, working magic with it on this stunning tag you've shared with us today! Cristina's tag: pure charm! I have a request for her book at our local library; excited to read it! Thank you again for another duo of delights! Cristina's tag is gorgeous...love the smidge of washi...gotta remember that. Tracey, I think this is one of my favs of yours! Who doesn't LOVE delicata?! Your tag is WOW. Great tags. When I use gold ink I usually emboss with gold too. I've heard so much about that ink, its definitely on my Wish List. The ornament looks fantastic and I bet it really does look amazing in person! And I'm loving this series, can't believe I missed it last year!!! What a sweet cut out house on the first tag- and beautiful gold ornament on the 2nd. I often emboss or die cut gold paper when I want gold - the inks sometimes don't stamp as darkly as I'd like..
Fabulous projects!!! Love them! I haven't used gold ink, but I am loving the look of gold embossing lately. Wow, just gorgeous! I have used gold ink in the past but it doesn't seem to cover very well no matter what brand I use. So I usually heat emboss instead! I have a gold ink and I don't care for it - I feel that the shimmery part stays on the stamp. I will have to check out this Golden Glitz Delicata ink! I haven't tried gold ink. I'm more of a silver lover. Tracey your card is stunning!! I am not a fan of anything gold so I have not tried any gold inks. Christina's card is wonderful. I wish I had a little punch or house shaped die cut like that! I love both the Delicata gold & silver inks - they are so deliciously shimmery and beautiful in real life, but hard to capture in a photo. I've had no luck with gold ink... GOld embossing works better fo rme. I love gold ink but so far, every gold ink pad I've purchased has gotten hard and dry and no good after a very short time. So if I want gold, I emboss with gold embossing powder. I love the shimmer of the Delicata ink. Going to have to give it a try. I usually just go for silver and gold EP instead. Nice idea to die cut a tag...would be great for a card too! Your ornament is absolutely gorgeous!